Karlie Kloss and Joshua Kushner's big day was such a whirlwind, the bride didn't get to bite into their layered wedding cake by Milk Bar until two in the morning. The 26-year-old model and her new husband embarked on their 'minimoon' on Sunday, but before they jetted off, she took to Instagram Stories share a photo of herself enjoying her wedding cake while sitting on the floor in her custom-made Dior gown. 'Finally got to eat my @milkbarstore wedding cake at 2am, ' she captioned the image of herself, which was taken in the early hours of Friday morning. In the snapshot, Karlie is leaning against the side of a refrigerator and holding a chocolate treat in her hand. The next photo shows the newlywed digging into her vanilla rainbow cake, which was layered with rainbow cake crumbs and topped with vanilla frosting. Milk Bar's 'Birthday Cake' is one of the most popular items on the menu at the dessert and bakery chain started by pastry chef Christina Tosi. And while it appears as though Karlie and Joshua had a custom cake made for their big day, but the company offers both six-inch and ten-inch versions of the confectionery creation on its website for $50.50 and $113.30, respectively. 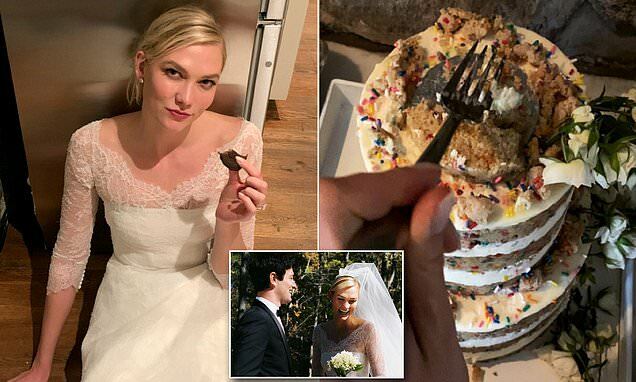 It's unclear if the couple saved and preserved the top tier of the cake to eat on their first anniversary per wedding tradition, but the picture shows Karlie using a fork to finish off one of the cake's many layers. The cake may well have been a gift from Milk Bar's founder Christina Tosi, who is an old friend of Karlie's, and actually worked with the fashion star to create a special healthy cookie that was sold in the chain's stores and online.